Takahashi FSQ-106ED @ f/5.0 (530 mm F.L.) Captured at 2.1 arcsec/pixel. Shown at 3.91 and 9.38 arcsec/pixel. SBIG STF-8300M Self Guiding Package w/ mono ST-i, using AstroDon E-Series RGB and Ha filters. 9/17/2016 to 10/6/2016 Chino Valley, AZ with CCD Commander & CCDSoft. eXcalibrator v5.0 for (g:r) color balancing, using 271 stars from the APASS database. PixInsight processing includes calibration, registering, stacking, RGB creation, gradient removal, non-linear stretching with HistogramTransformation . 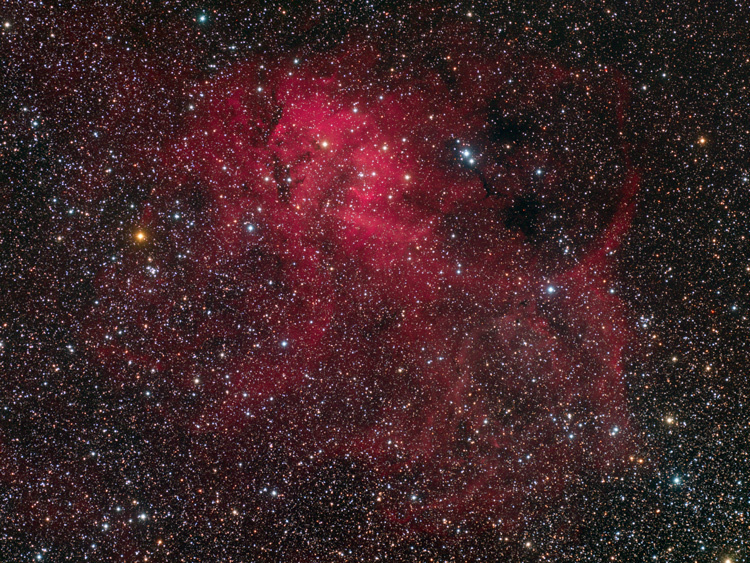 Sh2-132 is an extended emission nebula, at a distance of about 10,365 light-years, in the constellation Cepheus.